A couple months ago, in an extreme fit of frustration, I posted this whine about my slow internet. I even did a video, complete with irritating hum throughout, just so you could see how slow it really was. Well, I’m happy to say we’ve made some changes and things have improved. Let’s do a little before and after comparison. In the 15-18 years we’d been on the internet, we subscribed to a local, privately-owned internet service provider (ISP) company. We’ve always been advocates of non-corporate businesses and it was intriguing to be part of this company throughout its ground-up development. We live in a rural area so for many of these years we were on dial-up. Remember that resonating screech of connection? If you want to relive the old days, here it is! About eight years ago we broke down and purchased a wireless broadband antenna. To be specific, it was a Motorola Canopy Subscriber Module available through our ISP. We mounted this paddle-like antenna high on our 40-ft TV tower and from there it received transmission from an ISP tower located about five miles away. Purportedly, we were to get access speeds ranging from 2-6 Mbps (megabits per second). Megabits? Ha! I doubt we ever broke out of the gigabit barrior. And then there were the lightening strikes, the interference from other 900 MHz users and the inopportune disconnects (are there ever opportune disconnects?). Combine these with a growing list of other frustrations and I had reached my limit. As much as I wanted to support a local company, the unreliable internet it provided was not acceptable. In fact, it was hurting my business. So for two days I went into full-time research mode, I learned more about the state of U.S. telecommunications than is comforting, and I calculated some comparisons. In 2009, Congress passed the American Recovery and Reinvestment Act. As part of this provision, specific communications companies received subsidies, which they in turn offered to new satellite broadband users by way of free setup and discounted rates. WildBlue Internet (Exede) is one of these companies. Yes, it’s a big, nationwide company, and no, it’s not one I’d normally patronize. Sometimes though, my high-and-mighty ideals just don’t work out. So now we have this not-so-attractive dish sitting on our roof just outside our attic window. 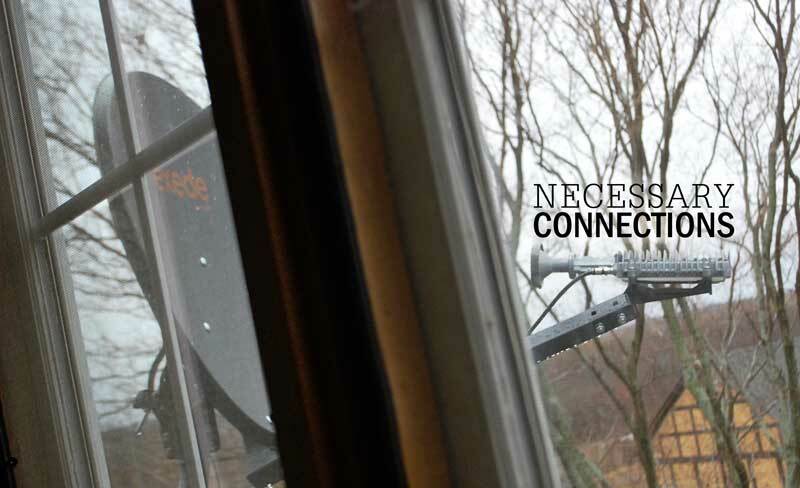 It connects to a satellite located somewhere in the southern sky and, for the most part, it’s bringing fairly reliable internet (no, there isn’t TV with this satellite). Recently, data showed my my speed clocking in at 10 Mbps—that’s not cable internet fast, but compared to what I had before, it feels like the speed of light! More importantly, it doesn’t cut out like my previous internet and, so far, working with the company’s service reps has been a pleasant experience. So there you have it. I can probably quit whining for a while. But just so you know, the whole broadband issue isn’t going away soon. Here in my Badger state “a lack of reliable and affordable broadband service in many areas in Wisconsin is hampering the ability of individuals and businesses to capitalize on new technologies,” according to this recent Milwaukee Journal Sentinel article. Justifiably and thankfully so, there are many organizations pushing for change. What about you? What internet are you using and how’s it working for you? What are your thoughts on better access in the U.S.?